How dedicated are you to prayer? How does it compare to other things you are dedicated to in your life---like your work life, spouse, children, hobby, sport? Are you dedicating your life and your day to God through prayer? Are you making time to be in conversation with God in the morning and throughout the day? "Lord Jesus, encourage my children to be devoted to prayer. Cause them to desire to kneel in the morning each day and to talk with you throughout the day. Inpsire them to wait for your answers and to live their lives according to Your will. Amen." As parents I know we all want many things for our kids...good grades, friends, comfort, success, joy, fun times, greatness. But there is no greater joy than to know that your children have a personal realtionship with Jesus Christ. Since Tori and Jordan have been babies, we have planted the seeds of truth in their hearts. We have brought them up to know the Lord and to praise and worship Him. We've laid the ground work and prayed that they will continue this path their entire lives. As a mother, I've been praying lately that now that they are teenagers they will hold onto their faith and beliefs with conviction. Not only that, but I've been praying that God would test them and strengthen them and give them opportunities to be TESTED in their faith. It's easy to say "I believe this" because it's all you've ever known. It's entirely another thing to say "I believe this because...well, because *I* believe it! It's my own belief! I own this belief and CHOOSE it as my own!". This week I have witnessed the fruit of many years of parenting...the day that our 16 year old daughter has been tested of her faith and convictions. It's called PEER PRESSURE. She has been tested deeply. I am so humbled and inspired by her convictions...she stood up and claimed her beliefs as being her OWN this week. She took a stand against peer pressure. She is left standing alone and by herself. She is hurting...but amazingly strong and showing her true character. Peer pressure is so hard...even for adults. To see a teenager stand up for what's right in the eyes of God gives me a deeper conviction in my own faith. It's inspiring beyond words...even more so because it's my own daughter. This week, I encourage you to pray for your children. Pray for their faithfulness and that they will be devoted to prayer. Pray that they will be careful and guarded. Pray that they will walk in the truth. Pray every day that God will encourage their walk and draw them closer to Him. And pray that He will give you words of wisdom when your child needs you. Lord Jesus, I pray that you will lead my children closer to you and that you will encourage them to walk in your truth. Please give me wisdom as a parent to say what you want my children to hear. Amen. Recently I posted about a beautiful little song, Cinderella, written by Steven Curtis Chapman...I'm so sad to say that this past week that wonderful song writer/singer and his family experienced a tragic and unthinkable loss: the unexpected death of their little 5 year old, Maria. I can't even imagine a loss like this---and it causes me to thank God for my own children and each and every special day I've been gifted with their lives. I learn so much ABOUT God through my own children! His love and His patience and kindness is evident in them. So, while I haven't posted to this blog in a while, I wanted to pop on here and suggest that you hug your children today---thank God for them and pray that His angels are protecting their every breathing moment. The primary purpose of prayer is not so much to get answers but to DEEPEN our relationship and friendship with God. When we pray we are spending time with God...and just as in any relationship, the more TIME we spend with someone, the more we get to KNOW them. God wants us to get to know Him...He wants to spend time with us! Spending more time with God is how we get to know His character! He WANTS to reveal His character to us! Reading the bible without prayer is only half as powerful as reading the bible AND praying. Likewise, praying without reading the bible is also only half as powerful as praying AND reading the bible. "The fewer words, the better prayer." One of the greatest things God has shown me recently is to pray...and then be slient. To listen. To hear the Holy Sprit in the quietness of my prayers. Seems like so many people spend most of their time on their knees "talking"...but the day you "listen" as much or more than you "talk", is the day your prayer life will transcend into a prayer-life beyond your greatest or wildest expectations. The Holy Spirt is IN your heart, IN you, and yes, in your quietness He will impress your heart and direct your paths. Try this: be silent for double the time you pray...and then open the Word of God and spend 30 minutes meditating on His Word. Read a few Pslams, something from the old testament and then something from the new testament. He will lead you into great understandings and revelataions that will be answers to prayers and lead you to live a life of godliness that particular day. God WANTS us to come to Him and ASK HIM BOLDLY for the things that are on our heart. The key word here that I'm talking about is...BOLDLY. As with confidence knowing He WANTS us to ask...boldly. He WANTS us to pray...without hesitation. Without wavering. Without wondering. With confidence knowing that He wants only good things for us. And he WANTS TO ANSWER OUR BOLD PRAYERS. Don't get me wrong...I've read this before. I've heard this before. I've known this all along. But I really GOT it this week through several experiences that I truly believe the holy spirit was using to convict my heart. Sometimes I think we are not convicted in our own prayer-life. That we don't REALLY believe God wants to answer us. Or that we don't REALLY approach Him...BOLDLY. And with confidence. This week, when I read the Psalms, it really stood out to me how absolutely CONFIDENT David was in his prayers to God. He was CONVINCED that God was listening ready to answer. He was 100% sure in his prayers that God was the Almighty and WOULD save him, that God WOULD deliver him and that God WOULD bless him. He stated FACTS about God, TO God, as if to say "Lord you ARE the Almighty and you WILL deliver me because you SAID YOU WOULD. You WILL help me and save me from my enemies because YOU SAID YOU WOULD. You WILL answer my prayers BECAUSE YOU PROMISED ME YOU WOULD". He was reverent and humble in his prayers to God, yet he prayed BOLDLY. He prayed CONFIDENTLY. He prayed bold prayers persistently. And he prayed with conviction that God would hear him and answer one way or the other! Open up your bible to Psalms and read for yourself what I'm talking about!!! David had the guts to face God with BIG PRAYER REQUESTS with CONFIDENCE that God would be RIGHT THERE to deliver him. Above emphasis is mine (capitals) and it isn't as if David was DICTATING to the Lord...no, he was NOT telling God WHAT to do. If you read the whole context you will realize that he was acknowledging God would do it BECAUSE OF His power and promises and ABILITY to answer and that David had come to know and believe this without underestimating God's power and willingness to answer. He was simply praying with CONFIDENCE that the Lord was POWERFUL enough to do it, if it was in His WILL to do it. No...I'm NOT talking about "God, I really want this-and-that and money and success and a big house and a new car and a great job and a perfect little life." I'm not talking about a laundry list of things that will benefit us, thinking that if we ask in His name to further our comforts and material possessions or status in life He will do so simply because He can (although sometimes those things are extra blessings God bestows upon us). I'm talking about completely giving in to God's will, laying down our lives and requesting that He will direct our paths and open doors and close doors that will align our lives with His will...and asking for this WITH 100% CONFIDENCE that He WILL do it...because He promises us that He WILL. Of course, we must know that it will be all in His timing and for HIS glory and HIS plan, beyond our own life and little world. And then we need to be prepared to walk through the door that HE opens...regardless of whether or not it's the door we thought would open...or a door that even existed. We must be prepared to accept God's answer to our prayers...no matter what the door looks like. 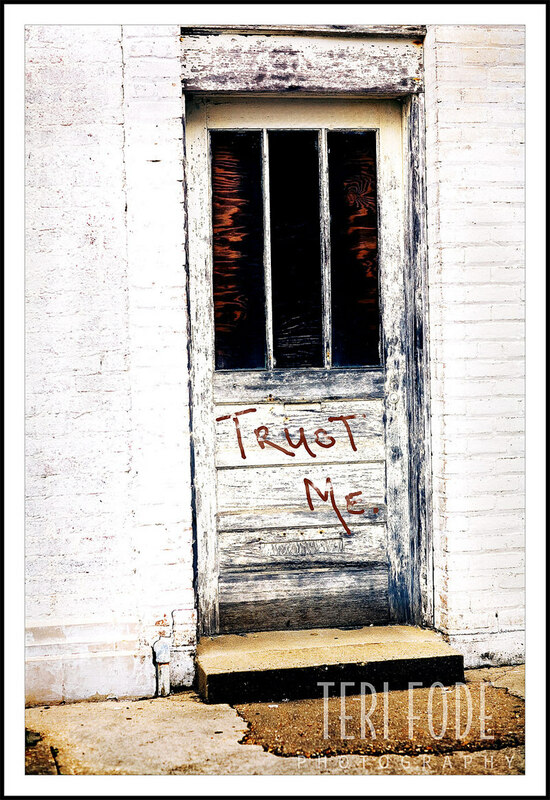 This photo of an old door was taken while I was in Houma, Louisiana a few weeks ago (the words "trust me" were added by me in post-processing)...it struck me as a door that God would use to test us with. It's so like God to use the humble and unlikely to glorify Him and represent Him...and in that unlikeliness He has a GORGEOUS BEAUTIFUL canvas on the other side...more valuable than pearls and gold and diamonds. As if to say "my child, THIS is the door I've chosen for you. THIS is the path you need to take. It might not LOOK LIKE IT to you right now, but trust Me. Walk through it. Because on the other side of this door is a life you've never even imagined. It's BEAUTIFUL. A life full of joy and peace and love that I have prepared for you. 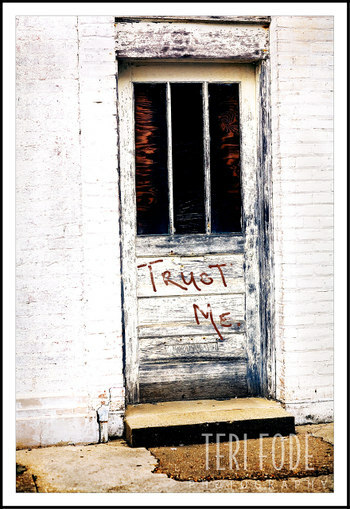 Don't be deceived by the looks of this door. It's not pretty. It doesn't look like the door YOU'VE imagined. But I have something in store for you BEYOND anything you could even HOPE to imagine...and therein lies the test. The test is simply to...TRUST ME. Walk through the unlikely door. Boldly approach Me and I will direct your path and show you the door I have prepared for you to walk through." I believe God delights in bold prayers. I believe He delights in bold people, with humble hearts. I believe He delights in answering the prayers of the faithful and confident. I'm convinced of this because of the BOLD people and BOLD prayers I see throughout the old and the new testaments! The entire book of Hebrews if full of boldness..."approaching the throne with boldness" in Hebrews 4:14-16 is just ONE reference to boldness. And 1John 5:14 says: "Now this is the confidence that we have in Him, that if we ask anything according to His will, He hears us. And if we know that He hears us, whatever we ask, we know that we have the petitions that we have asked of Him". Maybe the reason there are so many seemingly unanswered prayers in the world is that we miss the "according to His will" part. And maybe it's because we also aren't confident enough that He hears and listens and DOES answer. Maybe we aren't BOLD enough, approaching the throne with BOLDNESS as we are instructed and encouraged to do. Being bold means being confident. God wants us to be confident, because confidence equates faithfulness. And having FAITH is what it's all about, now isn't it? to be BOLD when approaching Him in prayer! After all, I believe God loves to teach us! And boldly praying for Him to teach us to pray boldly is quite biblical! This all came about after realizing that I'm a bit sheepish in praying BOLDLY because I always want to make sure I'm praying unselfishly, and within God's will. I've moved beyond praying for externals and praying more for internals, like the condition of my heart and mind---being humble, caring and selfless. So in that way of thinking, I think it can cause us to approach God with uncertainty, as in "okay Lord, I don't want to pray the wrong thing, I don't want to offend You, I don't want to be selfish and I want to be pleasing to You in my requests..."
After studying the Psalms the past few days, I am convicted in my heart that God would want us to be BOLD in our requests, first off asking Him to lay upon our hearts the matters that concern Him, and to change our hearts so that we ASK HIM for things that DO PLEASE HIM! Then, with BOLDNESS...approach Him knowing He WILL answer those prayers because He promises us He will! Teach us, Lord, to approach you with confidence, praying boldly with faith that you will answer our prayers. Lay upon our hearts the matters that concern You; things that will glorify You, that are within Your will and your plan for our lives so that you will certainly delight in answering us AS YOU'VE PROMISED YOU WILL.